Have you considered switching your business practices to those that are congruent with the green living movement? Going green is a full swing for businesses. Not to mention it might seem like a tough and hard to take make the decision. But let’s get going a bit further into this and see how it might benefit both you and your business as a whole. There are many health and environmental benefits to going green in your business. On top of that, there are considerable financial benefits for a business that decide to embrace green practices. I am sure that your business has monthly expenses and utility bills that can add up and affect your bottom line. Changing your business building to be more energy efficient can significantly reduce your monthly utility bills. There are many small and large changes that you can make to reduce business cost and become more energy efficient. Here are a few small changes that you can make today. I know that the health of your employees is important to you – both on a personal and business level. Did you know that commercial cleaners contain chemicals that are linked to various physical health concerns? When you use these products in the workplace, they can lead to an increase in illnesses and cause your employees to use sick time. By making this simple switch to green cleaning products and hygiene products, you will have happier and healthier employees who use less sick time. When they are out, projects can get behind and workload can add up. When you use green products, there is a better chance that your employees will stay healthy and will spend less time playing catch up. Some potential employees specifically want to work for a business that uses green living practices. They know the benefits and are excited to come to work. For example, using natural light rather than fluorescent lighting is easier on the eyes and can help boost productivity. Companies who are truly committed to going green may even allow employees to telecommute one or more days each week. Being able to work from home is considered a big plus for many people and can increase the happiness of the employees that are working for your business. People vote with their money. This means that they are going to support businesses that have practices that are congruent with their belief system. The growing number of people who support being environmentally responsible are the ones that appreciate businesses that do the same. Larger companies are already noticing a positive public response to their businesses’ environmentally conscious changes. Understanding the need to protect the environment is becoming increasingly prevalent in our society. New regulations and guidelines are always being developed to increase sustainability. Why wait until your business is forced to find a way to comply with these practices under a deadline? Take the initiative to start being greener now. When new regulations are enacted, your business will already have systems set in place to be more energy efficient. The government developed a baseline business which allows them to compare your building to the baseline building. To receive the tax break, your building must show that it is at least 50% more energy efficient than the baseline. An engineer will come and perform a site visit to see what improvements have been made. You can also go back three tax years and amend your returns to receive still the benefits of going green. 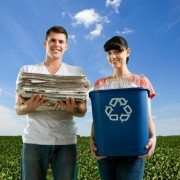 There are several ways a business can show sustainability. Making changes to your business to become more energy efficient does take some time and planning. However, receiving the tax deductions makes the effort worth it. The tax break will allow your business to grow and save money each year. It is a very smart business strategy to introduce a green initiative into your company policies. It can help you to save money, increase employee health and happiness, improve public opinion and allow your business to stay ahead of coming changes. On top of all the benefits that come with going green, you can also receive tax benefits of $1.80 per square foot. Now is the time to make a plan to help your business take the step toward green living. If you have questions or would like more information about the 179D tax deduction, contact Walker Reid for further assistance.